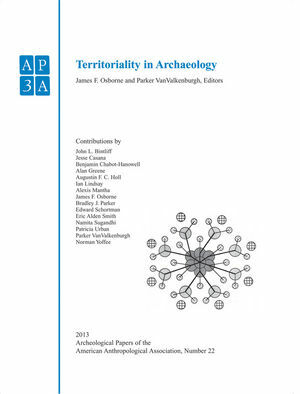 "Territoriality in Archaeology brings together a series of studies that examine the dynamic nature of land, boundaries, and social space in ancient political life. The authors draw on diverse perspectives, ranging from evolutionary ecology to critical geography, but share a common interest in exploring variation in territorial patterns and processes, as well as developing models that better account for the role of territorial claims in the constitution of social power. Archaeological case studies exploring the diversity of territoriality in the past range from the Andes Mountains and Latin America to Mesopotamia and South Asia." The Archaeological Papers of the American Anthropological Association (AP3A) is published on behalf of the Archaeological Division of the American Anthropological Association. AP3A publishes original monograph-length manuscripts on a wide range of subjects generally considered to fall within the purview of anthropological archaeology. There are no geographical, temporal, or topical restrictions. Organizers of AAA symposia are particularly encouraged to submit manuscripts, but submissions need not be restricted to these or other collected works. James F. Osborne (Ph.D. 2011, Harvard University) is an Andrew W. Mellon Postdoctoral Fellow at Johns Hopkins University, director of the Tayinat Lower Town Project, and associate director of the Erbil Plain Archaeological Survey. His current research interests include diaspora in antiquity and the nature of political authority in the Bronze and Iron Ages of the ancient Near East, especially as revealed through spatial analysis of the built environment. Parker VanValkenburgh (Ph.D. 2012, Harvard University) is Assistant Professor of Anthropology at the University of Vermont and director of the Proyecto Arqueol´ogico Za˜na Colonial. His current research centers on understanding landscape change and political subjectivity in late pre-Hispanic and Spanish colonial Peru.